Mezze is a selection of small dishes served in the Middle East and the Balkans as breakfast, lunch or even dinner, with or without drinks. This dish is a refreshing low carb dish packed with fresh veggies. Considering it is void of meat it still presents with decent protein and fibre content. Its low fat but you won’t miss any flavour. Eat it as a side, a lunch main or stuff it in a pita with some shaved ham or pastrami. Put the tomatoes into a strainer (sieve) to drain off any juices. Put the bulgur wheat in a bowl, pour hot water to cover, and let soak for 15 minutes. Drain the wheat in a strainer lined with cheesecloth (muslin), pressing out as much liquid as possible. Mix together the parsley, cucumber and scallions in a bowl. Add the mint and bulgur wheat, then tip in the tomatoes. 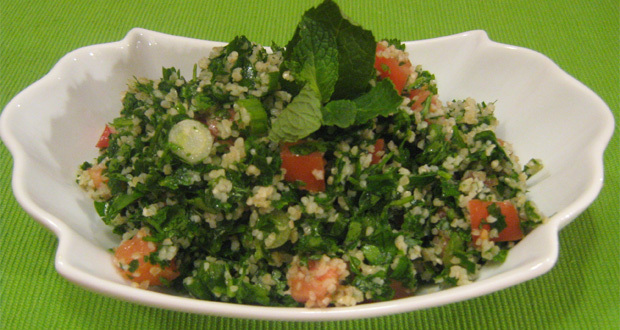 Wisk together the lemon juice, salt and olive oil in a bowl, then pour the dressing over the tabbouli and mix well.